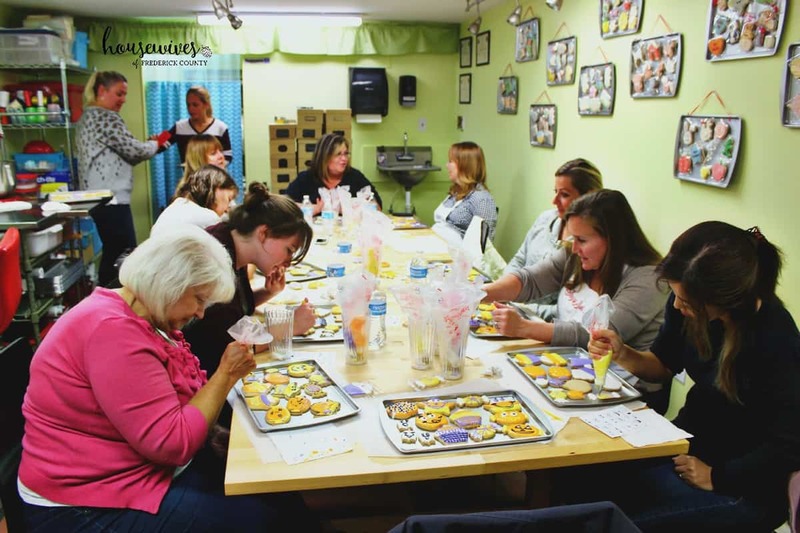 I’ve always really admired women who can make dozens and dozens of decorative sugar cookies for their local cookie exchange or holiday gathering. Making and decorating sugar cookies has always been very intimidating for me. It’s why I’ve never made a decorative sugar cookie in my life. Last year I came across some pictures on Facebook that one of my friends had posted. She was with some of her neighbors at a cookie party, holding up these beautifully decorated sugar cookies that she had made. I had to know where this party took place and how I could get in on the action. I found out that the name of this heavenly place was Sugar Dot Cookies. I did some research and found that it was located in Middletown, Maryland. Right down the street from me. Then I found out something even more surprising. The owner, Dotty Raleigh, is an acquaintance of mine who I met through Etsy years ago. She used to make the cutest cupcake pincushions and I made jewelry. 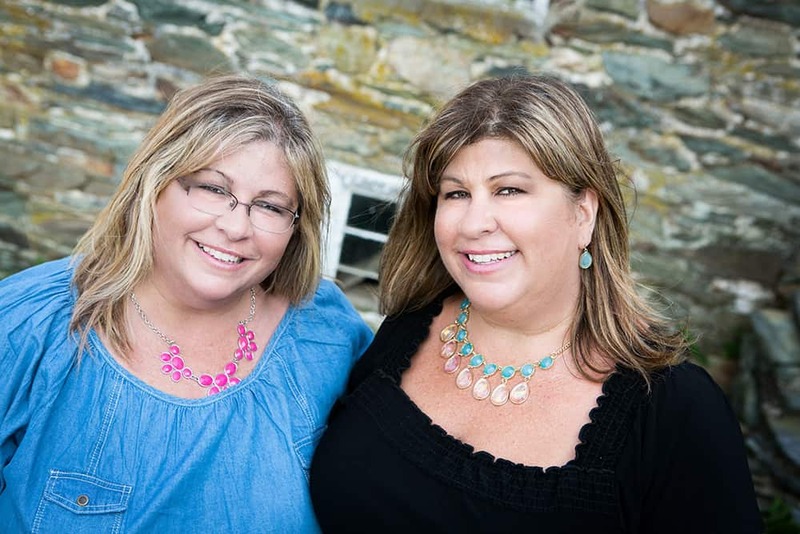 We did a couple of craft shows together. She even attended one of my jewelry parties and hosted a jewelry party for me. Then somehow we lost touch. I stopped jewelry and she stopped her pincushions. Fast forward to about 6 months ago when we reconnected. She with her successful cookie decorating business and me with my blog. 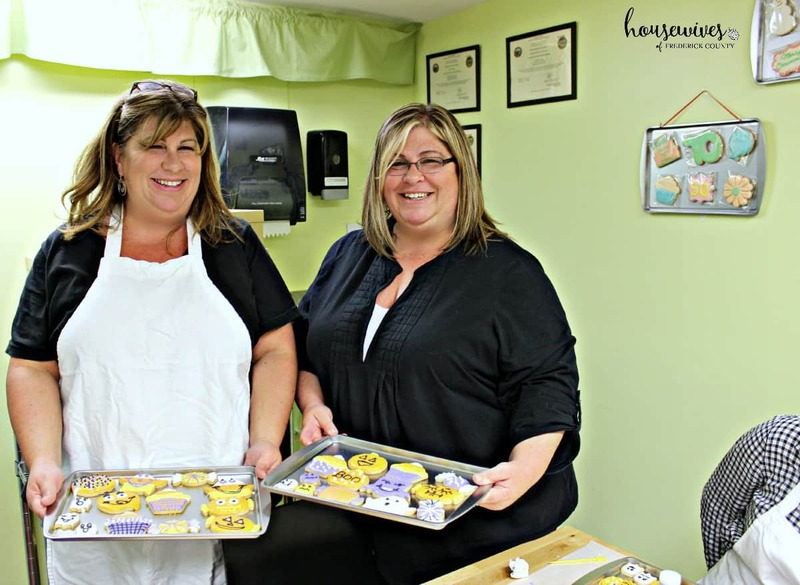 We decided to do a Housewives of Frederick County Sugar Dot Cookie Party! When you enter her shop you immediately notice how organized and creative Dotty is. 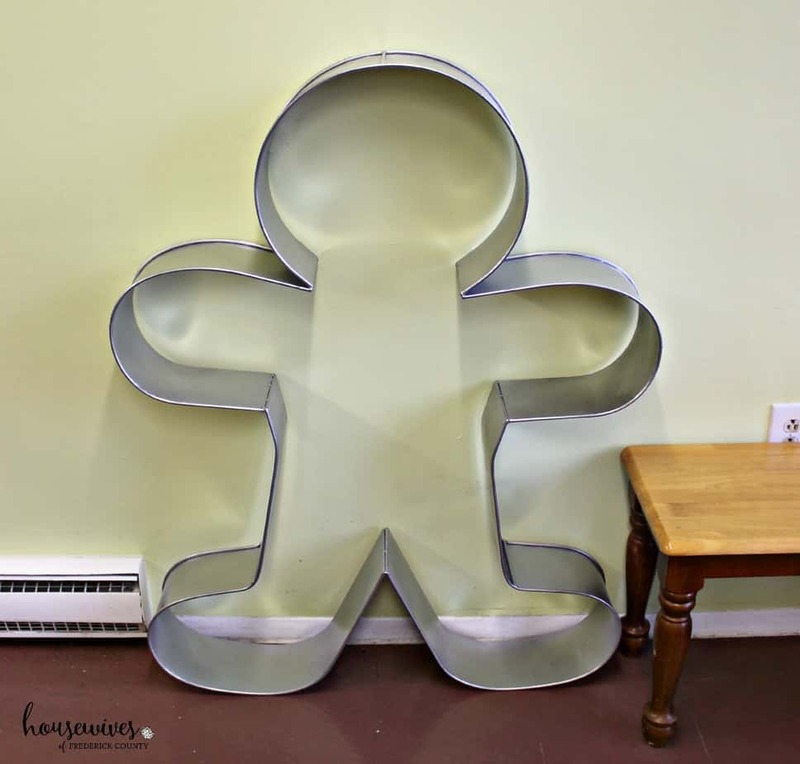 She has cookie sheets lining one of the walls, displaying the various themed cookies. From holidays, to pets, to birthdays, weddings, baby showers, sports, teacher gifts, summertime, graduations and more. She has a theme for every occasion. When we arrived, Dotty already had the long table setup with a cookie sheet for each attendee. Sugar cookies that Dotty made ahead of time were ready for decorating. She also lined the table with examples of the party themed cookies. We could copy these examples exactly or use our own style to decorate them however we wanted. 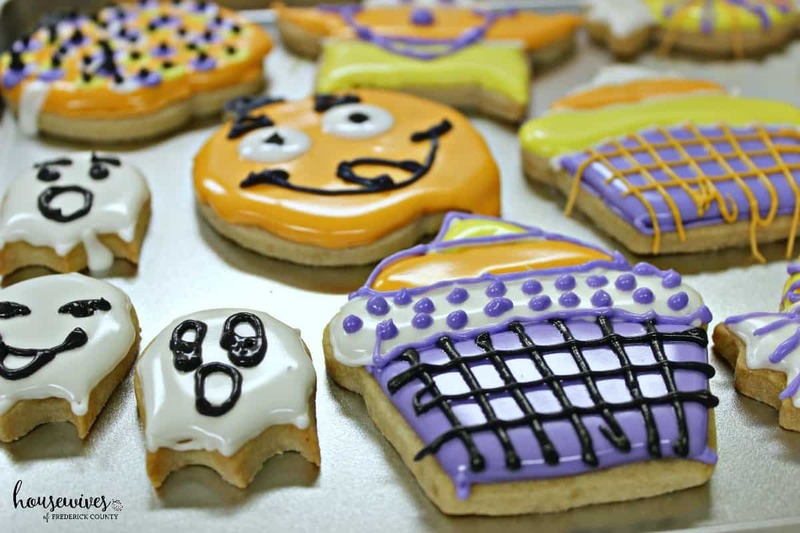 Frosting in all of the Halloween colors was placed in bags with decorating tips. The small tipped bags were labeled as small and the large tipped bags were labeled as large. This was important to know once the decorating began. Here’s Dotty sitting next to her Thanksgiving themed cookies. Leaves, turkeys, pumpkins, and ‘Give Thanks’ cookies. 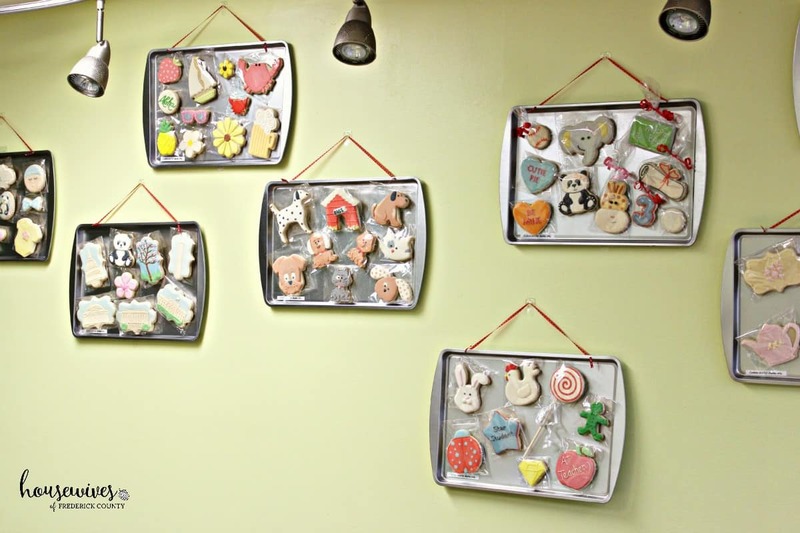 The possibilities are endless in the decorative sugar cookie world. Each cookie party lasts for 2 hours. This isn’t a bring-your-own-wine-and-cheese-and-stay-all-night type of party. This is a get-down-to-the-business-of-decorating-cookies party. I loved how prepared Dotty was for all of us. I tend to get nervous, intimidated and uptight when I’m learning something out of my comfort zone. Dotty reassured me that I would love it. Before we got to work, she sat down and explained some of the basics. You use the small tip, thicker frosting to outline your cookies. She demonstrated the best method of holding the frosting bag and when to lift and lower the frosting to the cookie. 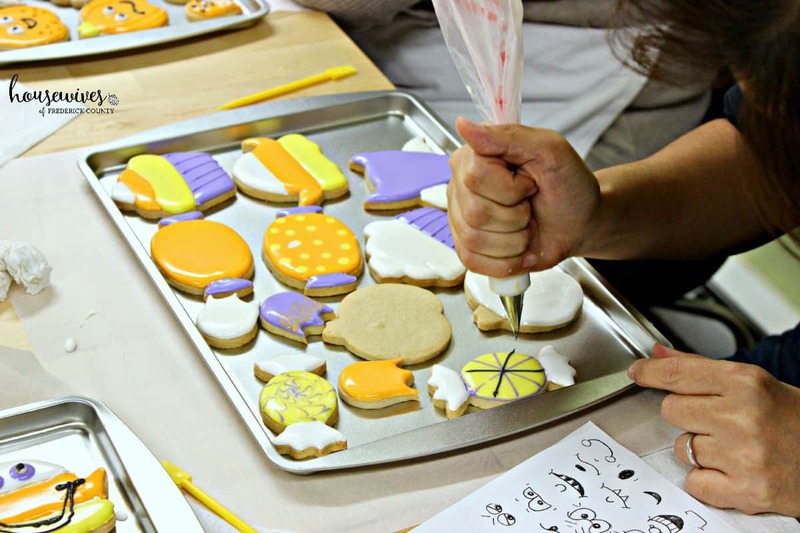 Then when the outline has dried, you use the large tip, thinner frosting to ‘flood’ inside the lines of the cookie. She suggested that you do all of your outlines first and then go back and do the flooding. Similar to an assembly line. After the flooding, that’s when you add any details, such as polka dots, or lines or eyeballs for our ghosts and pumpkins. Details are added using the small tip, thicker frosting. Adding the details before the flooding frosting has dried will allow the details to sink into the rest of the frosting and result in a smooth look. 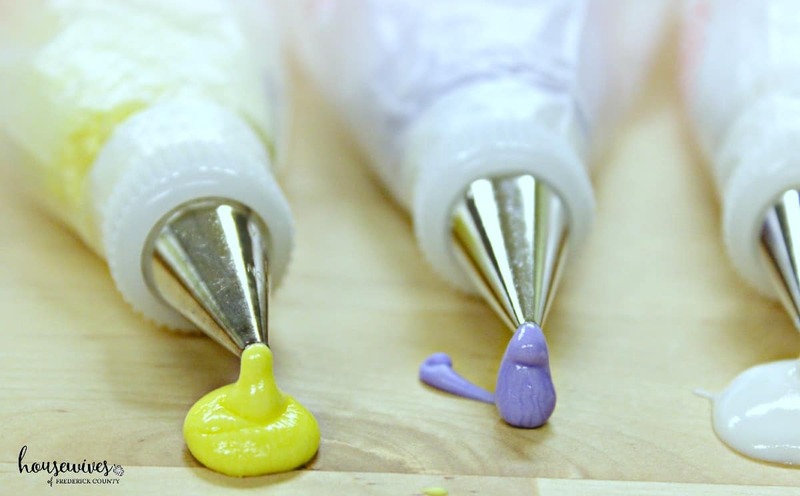 If you want a raised, textured look, you wait until the surface of the frosting is dry before adding any details. Once we had all of our instructions, we all got to work. There were several ladies there who are regular party-goers. They’ve gotten their sugar cookie decorating down to a science. Then there were newbies like Terri, Mae, and me. It was really fun seeing each individual’s decorating style. My style was a little goofy and carefree. Whereas others were very artistic. I love the pumpkin with the raised lines. Everybody’s cookies looked so good, it was hard to imagine that they would get eaten. But who am I kidding, really? I couldn’t wait to sink my teeth in one! Dotty told us we needed to allow the frosting on the cookies to dry overnight before eating any. We were allowed to take our cookies home directly on the cookie sheets. I have to say these cookies were the best sugar cookies I’ve ever tasted. 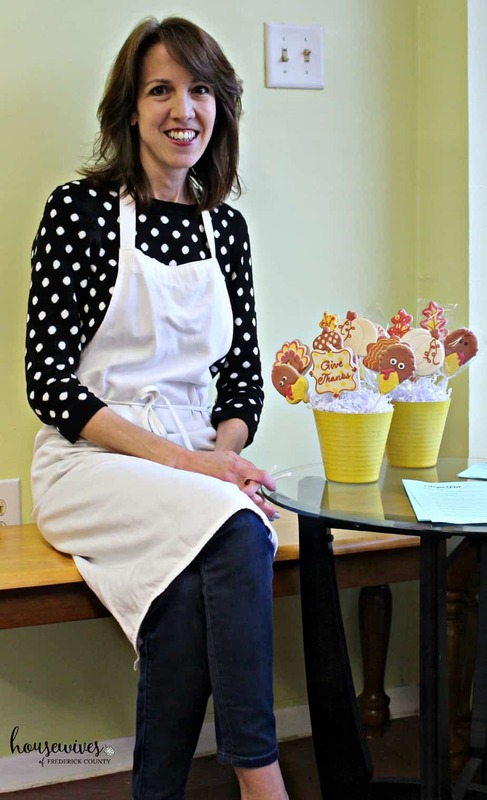 Dotty has her cookie and frosting recipes printed out for each attendee to take home with them after the party. Going to one of Sugar Dot’s Cookie parties gave me the decorative sugar cookie bug. I really think I can do this now! 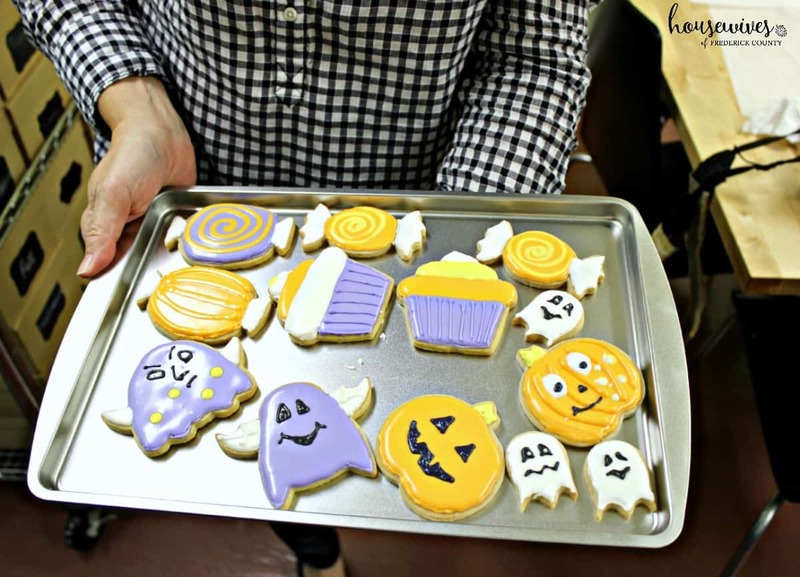 I foresee more Sugar Dot Cookie parties in my near future. I love the convenience of having the delicious cookies and frosting already made and ready to decorate. Besides cookie parties (and she offers them for kids too), you can order cookie platters, favors and cake toppers. 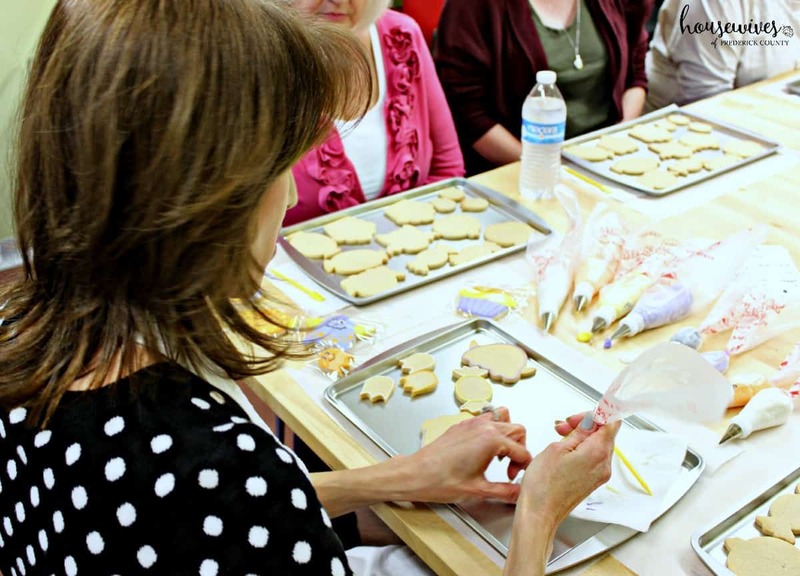 Dotty also offers more in-depth cookie classes: one-on-one or one-on-two. 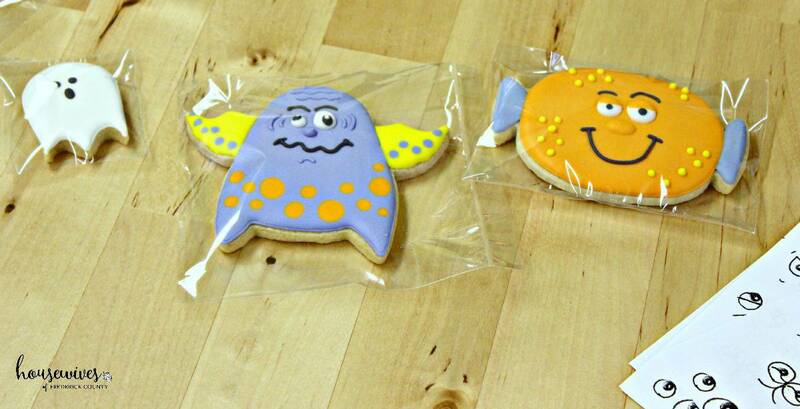 Sugar Dot Cookies can be shipped anywhere within the continental U.S.
Just make sure to order early! 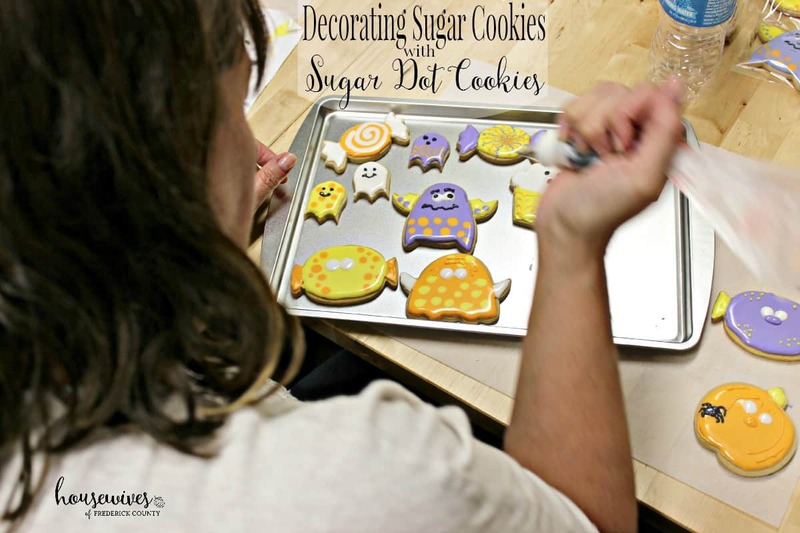 If you’re local, have you ever been to Sugar Dot Cookies? Tell us your experience and what theme you made. 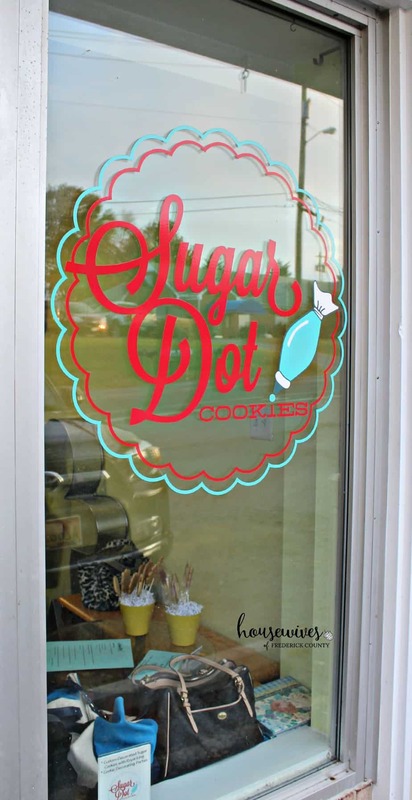 If you’re not local, do you have an awesome place similar to Sugar Dot Cookies in your town? Thank you Dotty! 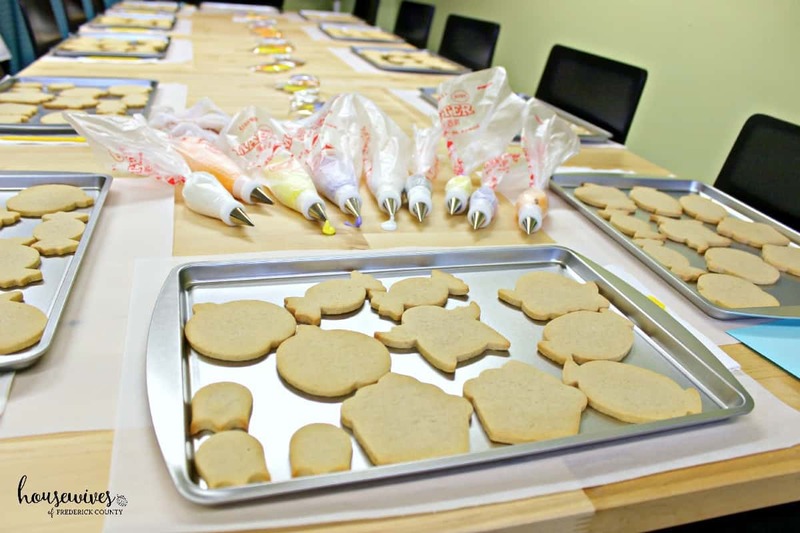 We really enjoyed ourselves and learned the art of cookie decorating thanks to you! And they were the best sugar cookies I’ve ever eaten. Never thought of this for a date night. That’s genius! Come on up to Middletown and join us for a cookie party sometime girlies! This is so unique!!! I would love to hear details when we meet for lunch! I know Cheryl. It’s a great concept and so fun!